Proud breeder and owner Jens Thorsen with Sonnerie Souveraine - private photo. 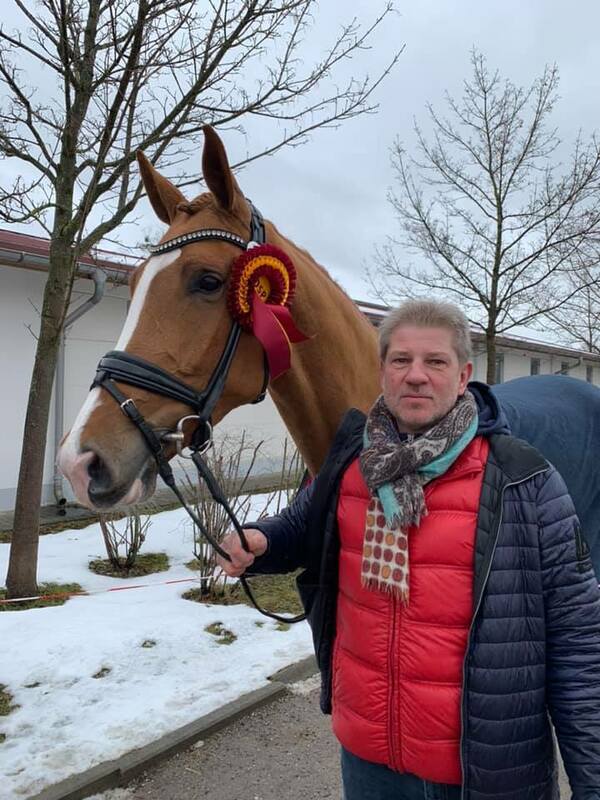 Among them was the now 4 year old mare Sonnerie Souveraine by Sezuan / Silvermoon, bred and owned by Luxemburg based Danish Jens Thorsen, Gestüt Pallerhaff. Sonnerie Souveraine became reserve champion today at the DSP mare show. Back in August 2018 Sonnerie Souveraine became champion mare at the elite mare show at Landgestüt Zeibrücken. Out of the same Silvermoon mare Thorsen has a successful full brother, now 5 year old Spectre which last year became both Landespferdechampion, reserve champion at South German Riding horse championships and bronze winner at the Bundeschampionate in Warendorf under Kristine Møller, Gestüt Pallerhaff. Sommelie Souveraine looks like a very special mare bringing three top gaits and a very elegant type, for sure an interesting mare also for breeding. From H2R point of view the champion mare today. “Sommelie is just very lightly ridden, and showing super nice qualities for the future, but we (rider Kristine Møller) has no hurry starting her education, and the plans for now is to try to do embryo transfers in the spring,” tells Jens Thorsen.